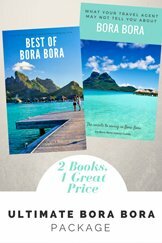 What to Take to Bora Bora? Get excited just thinking about what to take to Bora Bora for your tropical Bora Bora vacation. It's always the best time to go to Bora Bora because weather there is warm all year round and the lagoon is a constant 26 degrees. 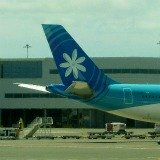 So fill your bags with light weight cotton summer clothes (fabrics that breathe), give your beach gear priority, and start dreaming of Tahiti cocktails. 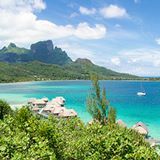 If you are a woman wondering what to take to Bora Bora, a Tahiti romantic vacation is an opportunity to pack every skimpy summer dress you have. They weigh so little. 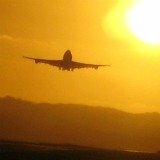 (Wear your flippers onto the plane, if necessary, that's where the weight is!) The air temperature in Bora Bora is so perfect in the mornings that you can reach for a little sun dress to slip on for breakfasts overlooking the sparkling lagoon. 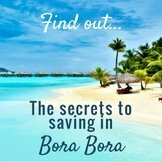 See our packing list of what to take to Bora Bora. 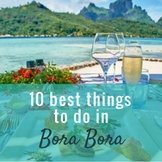 The magical, balmy evenings in Bora Bora invite you to stroll around the lush gardens and along the beach, or enjoy delicious Tahiti cocktails at your resort's bar before or after dinner. You can dress as casually as you like in this relaxed atmosphere. 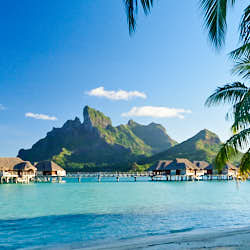 Imagine yourself in the photographs of the beautiful Bora Bora resorts. These romantic resorts are also an opportunity to dress as exotically or elegantly as you want! There is something 'magic potion like' about the Bora Bora island ambiance. I feel like a Princess, every evening I am staying in this paradise. 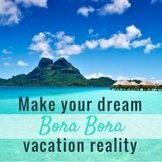 For all those accustomed to wearing suits and ties, your Bora Bora vacation will be a dream come true. You can veg out in casual, comfortable cotton T-shirts and cotton shorts. 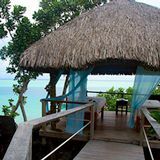 Bring some long pants and romantic cotton shirts for the evening if you are staying in a classy resort or planning to visit some of best Bora Bora restaurants and/or seduce your woman. She's worth it! 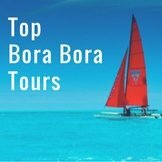 Check out the Bora Bora tours on land to find out what activities you want to do. If you plan on inland hiking you will need sneakers or rubber soled walking shoes. 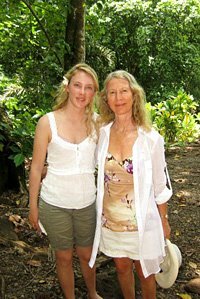 Sandals and thongs will be most comfortable for around your resort and activities like shopping. 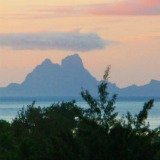 Look at our Bora Bora weather page to confirm how pleasant the winter temperatures are and when winter in Bora Bora occurs. Also notice that this is the season when the trade winds blow, so it's useful to have a wind proof jacket during Bora Bora winter. The evenings can be a little cooler so take a shawl, light cardigan or jacket to be comfortable. Our number 1 travel tip is, 'Always wear your swimsuit'. Often this means at-the-ready under your clothes, as walking around wearing your swim-wear in non swimming environments is not considered good etiquette in French Polynesia. Take a few swimsuits (swimmers, bathers, boardies) to ensure you always have a dry one to put on during your Bora Bora vacation. 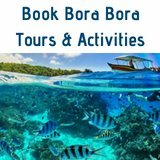 We advise that you choose your Bora Bora excursions and activities ahead of time as the best ones for exploring the lagoon environment can be booked out, especially during busy times. Anyone who doesn't jump in is missing out! The lagoon is like an enormous, natural swimming pool and everywhere you look (including under-water) is a potential 'screen saver'. Even at the end of the on land Bora Bora tours for exploring the island you may be dropped off at one of the magnificent Bora Bora beaches for a couple of hours (it happened to me). Take comfortable reef shoes. They are essential. 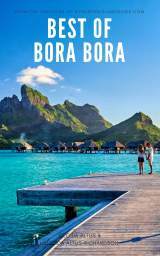 Find out more about the exquisite Bora Bora beaches. Thanks to the reefs surrounding Bora Bora Lagoon, the water is calm and warm. 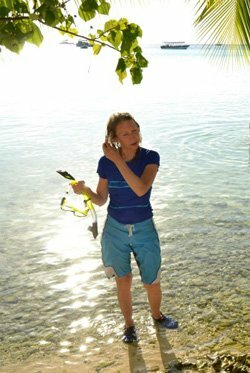 To protect your feet from small pieces of coral that may be lying on the sandy floor, wear reef shoes when swimming without flippers. during your Tahiti vacation. The top item you need in Bora Bora is an inexpensive hat. Your hat will be your best friend on your Tahiti vacation. And with all the Bora Bora water activities, it will definitely be introduced to the lagoon sometime. Every day will be 'hat day' so you may also want a stylish one as well, for lounging about Bora Bora resorts. I will share the Australian secret for being able to indulge in swimming, surfing and snorkeling for hours, without unwanted consequences. We have a strong beach culture and wearing a 'rashie' (rash vest or rash guard) has been made cool by the sun bleached surfies. Women wear trendy board shorts as well. 'Billabong' and 'Ripcurl' have become part of our language. 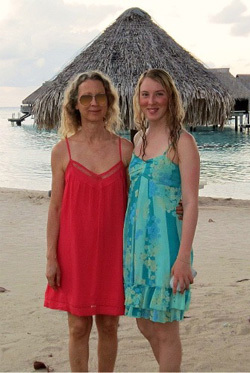 We even purchased long sleeved rashies for our Tahiti vacations, as the water temperature is so perfect that we want to extend our time in the sun. I recommend that you purchase a rashie. 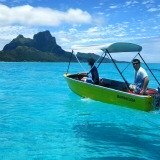 Whenever we engage in water activities in Bora Bora, a common question is 'Where can I buy one of those?' You can now buy gorgeous women's rash guards like this tropical Charmleaks Rash Guard for only $25! It's worth every cent to ensure you don't spend your vacation in sunburn pain. You will also need to pack lots of quality sunscreen. As you will smother this all over yourself (and your sweetheart), it is preferable to buy a non toxic sunscreen. Research has shown that damage done to skin by one ubiquitous sun filtering agent commonly used in regular brands, is increased through exposure to sunlight! Depending on where you are living, this may not be available. I source this type of product from iherb.com, a huge on-line store. Best prices! great shipping rates! Very fast delivery. I'm such a fan! I enjoy sitting in comfort, and at a time that is convenient, being able to peruse and read the ingredients to order all my personal products. It takes only four days for my pamper package to arrive in Sydney from North America. And when I am working overseas and located in out of the way places for months, this same efficient service brings them to my door. When placing your order with iherb use the referral code TUS876 to receive a discount. The Bora Bora resort you choose will probably be close to salt water, and water activities and excursions will entice you most days. So you will be in the no-mosquito zone much of the time. An extra advantage of having an over water bungalow is the absence of mosquitoes. Tahiti villas situated away from the beach will have mosquitoes around them once the sun sets. 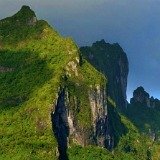 And when you take Bora Bora adventure tours inland and walk through the tropical vegetation, mosquito repellent is essential. Buy a non-toxic insect repellent to take. 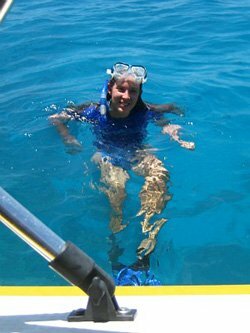 We advise everybody to take quality goggles, snorkel and flippers on their Bora Bora vacation. This includes you. Look at the spectacular Bora Bora snorkeling experiences waiting for you and you will know why. Your snorkeling gear will accompany you everywhere, so while you are at the sports store, buy a handy draw-string, mesh carry bag that allows it to dry off after use. The islands of Tahiti are very small, so garbage must be kept to a minimum. To comply with this policy shops do not give out shopping bags so they must be purchased. It is ecological to bring your own carry bags. Also, remember to bring a back pack or tote bag for day excursions. The cost of alcoholic drinks is quite high in the bars at Bora Bora resorts. If you want to relax with intimate drinks in your villa, you may want to pick up some alcohol as you pass through Papeete or if you have a ViniBag - a reusable, inflatable travel bag you can bring alcohol in your suitcase from home! At the Carrefour supermarket in Papeete you can purchase some delicious liqueurs made in Tahiti and using local flavors such as vanilla and coconut. Tahiti cruise ships have extensive air conditioning throughout their rooms. In your cabin you can set the temperature for your personal comfort. But in some of the public areas you will need light cardigans or jackets, especially in the dining rooms and theaters. When deciding what to take to Bora Bora you can happily forget your jewelry. You will see Tahitian women displaying their artistic shell bracelets and necklaces and want to adorn yourself island style. 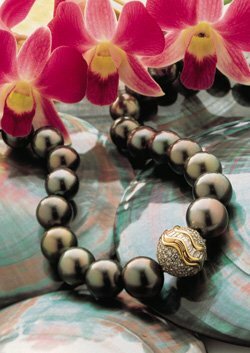 Find out what makes lustrous Tahiti pearls so valuable! 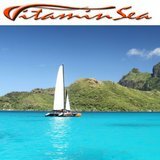 You can have a lot of fun and romance shopping for pretty pieces of Tahitian jewelry, both pocket friendly and precious. 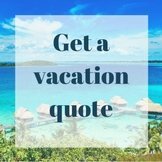 Over the rest of your life they will provide tangible memories of your romantic Tahiti vacation.